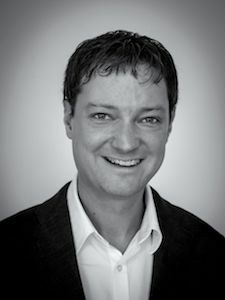 I am currently an assistant professor at the University of Geneva leading the research group "Galaxy Build-up at Cosmic Dawn". You can find all the details of that group here. We are working with extremely deep Hubble and Spitzer Space Telescope data as well as with submillimeter facilities to study galaxy evolution across cosmic time. In particular, my research is focused on understanding the build-up and assembly of the first generations of galaxies. Based on strong [CII] line detecions with ALMA, we were able to spectroscopically confirm two galaxies at z~6.8 and - for the first time - measure kinematic information of normal galaxies in the Epoch of Reionization, 13 Gyr in the past. These results were published in Nature (Smit et al. 2018), and the associated press release can be found here. The two spinning galaxies observed with ALMA in the COSMOS field. Credit: Hubble (NASA/ESA), ALMA (ESO/NAOJ/NRAO), P. Oesch (University of Geneva) and R. Smit (University of Cambridge). We recently managed to measure the distance to the most distant galaxy ever seen in the Universe based on a grism spectrum obtained with the Hubble Space Telescope. The galaxy GN-z11 is seen at just 400 Myr after the Big Bang, when the Universe was a mere 3% of its current age. GN-z11 reveals surprising new clues about how galaxies formed. 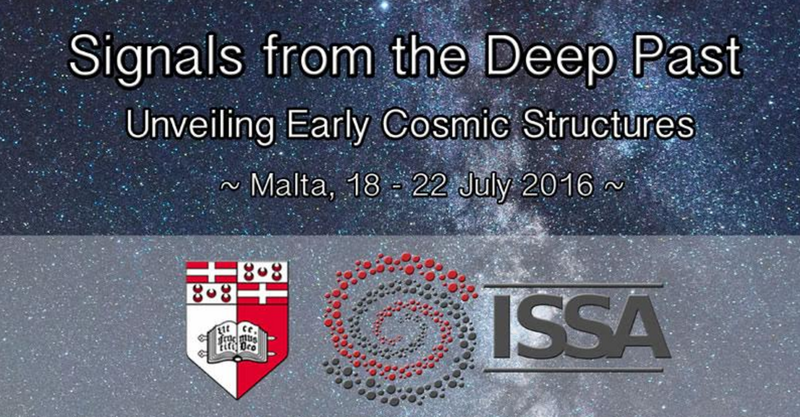 It shows that galaxy build-up was well underway very early on in cosmic history. 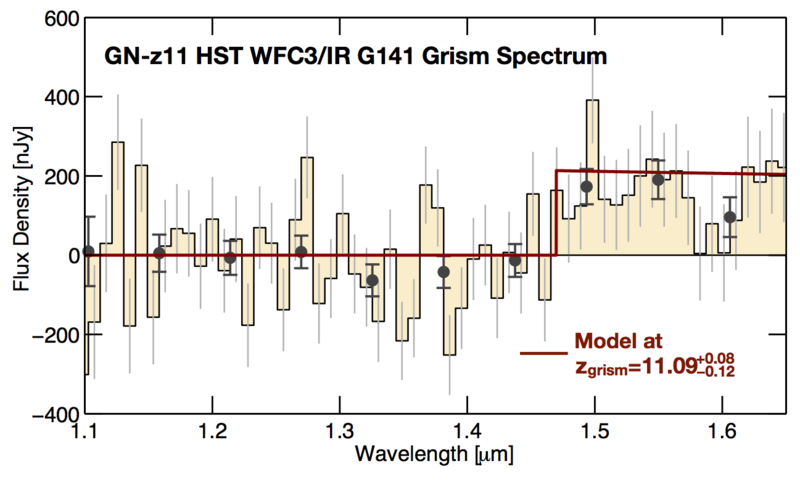 Grism spectrum for source GN-z11 obtained with the Hubble Space Telescope revealing its Lyman continuum break at z=11.09. The associated paper appeared in the Astrophysical Journal and is also available as a preprint on arxiv. For more information see our press release on this exciting Hubble result. The measurement of GN-z11 represents an immense success for the Hubble Space Telescope. It managed to both find the galaxy in the first place, and now also to measure its distance accurately. The previous distance records all came from galaxies that were found with Hubble, but then confirmed with larger aperture telescopes from the ground. For example, using the very powerful MOSFIRE spectrograph at the 10-m Keck telescope, we managed to obtain an accurate distance measurement to another exceptionally bright galaxy at z=7.73. 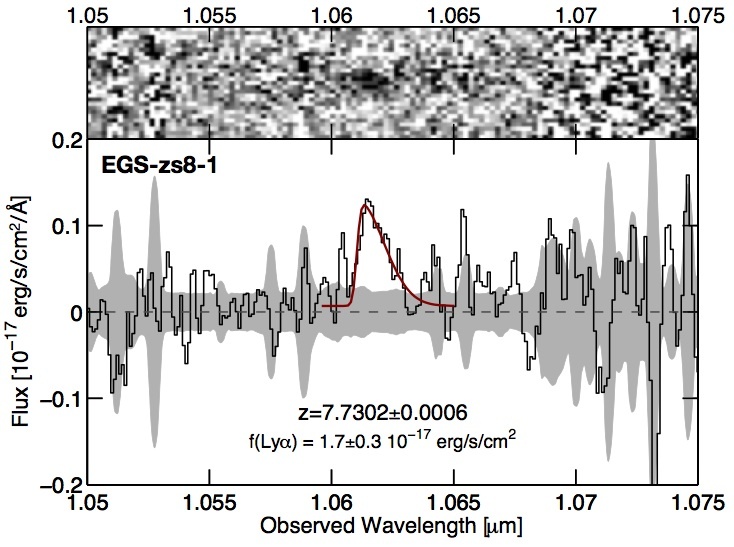 That source is called EGS-zs8-1, and it is still one of the most distant spectroscopically confirmed galaxies. EGS-zs8-1 is seen at a time when the universe was 670 Myr old. MOSFIRE spectrum of the source EGS-zs8-1 revealing its Lyman-Alpha emission line at z=7.73. The associated paper is published in ApJ Letters and is also available on arxiv. For more information see also our previous press release on EGS-zs8-1. I am the PI of a cycle 22 legacy UV imaging survey of the two CANDELS-Deep fields in GOODS-North and -South. Our program builds on existing WFC3/UVIS data to obtain deep images at 250-350 nm (in F275W and F336W). 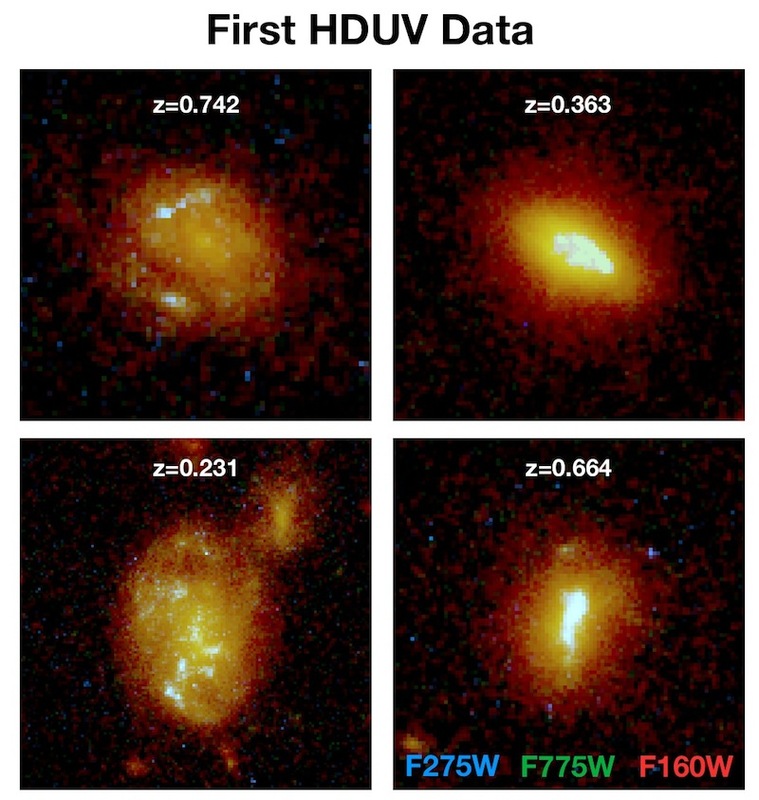 These data provide the first complete census of low-luminosity star-forming galaxies at z~0.5-2 and enable a wealth of research by the community. This includes measuring the physical properties of sub-L* galaxies, and characterizing resolved stellar populations to decipher the build-up of the Hubble sequence from sub-galactic clumps. For more information, please visit our survey webpage. 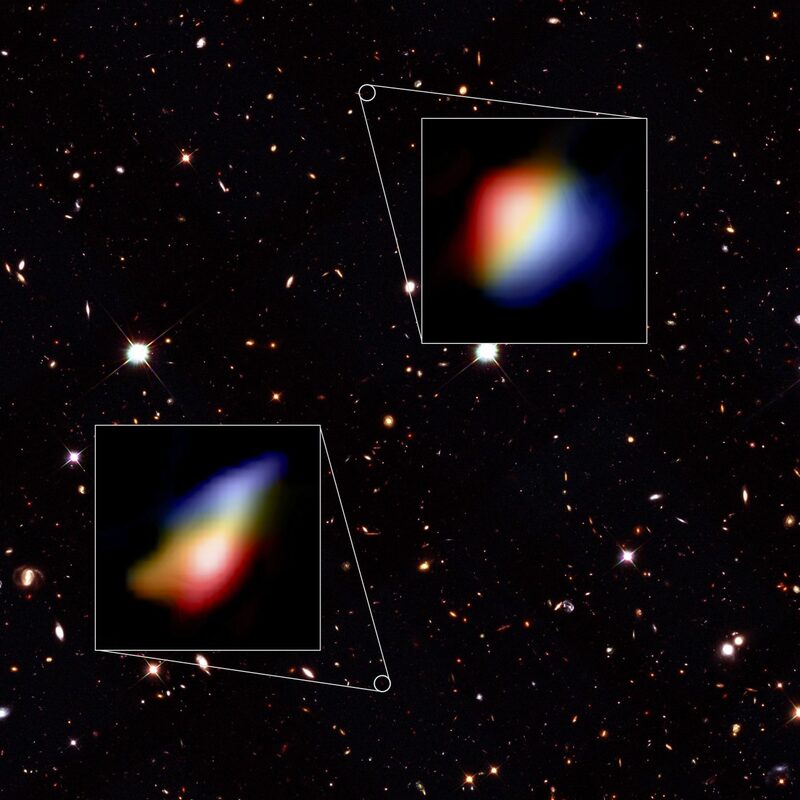 The image below, illustrates how the UV imaging reveals unique, new information on the location of star-formation in intermediate redshift galaxies. The fully processed, science ready data from our program can be downloaded from the STScI HST archive (MAST). Due to an increase in efficiency by a factor about 40, the installation of the WFC3/IR camera on the Hubble Space Telescope revolutionized our knowledge about galaxies in the reionization epoch. From the combination of our extremely deep HUDF09 survey with additional wide-area imaging it became possible to identify large samples of galaxies at z~7-8, and we were even able to find one first galaxy at z~10, only 500 Myr after the Big Bang. We recently created a new multi-color image of the Hubble Ultra Deep Field (called XDF), including all the available data in the optical and NIR that were taken over this field with HST over the last decade. 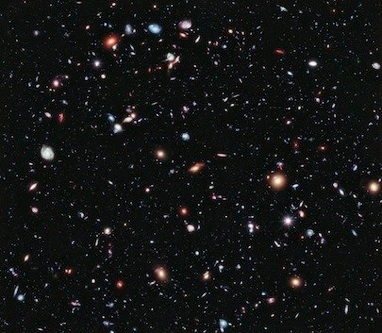 This new image provides the deepest view of the universe ever and is shown below. The full release can be found on hubblesite.org The actual multi-wavelength science data are also available on xdf.ucolick.org or from MAST. Some recent research highlights are shown below. For more information see also www.firstgalaxies.org and our page: xdf.ucolick.org. Thanks to large surveys with HST's WFC3/IR camera over the last few years, we have been able to push the observational frontier of galaxies out to z~10, when the universe was only ~500 Myr old. 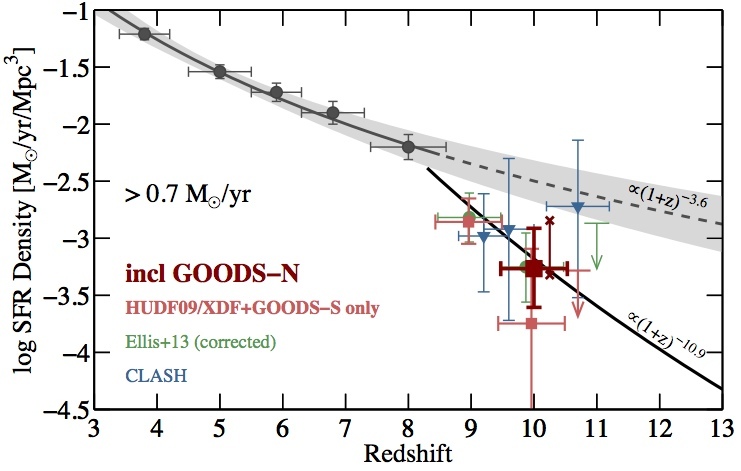 Even though small, the first samples of z>8 galaxies allowed for first constraints on the cosmic star-formation rate density (SFRD) in the heart of the cosmic reionization epoch. This is shown in the figure above, where the current estimates of the cosmic star-formation rate density are plotted for Lyman Break galaxies from z~3 to z~11 (limited at a fixed minimum star-formation rate of 0.7 M☉/yr). While star-formation appears to decline steadily from z~3 to z~8 (shown by the gray shaded area), we seem to be seeing a more dramatic decrease at z>8 (black solid line). However, due to the small sample sizes, the current uncertainties at the highest redshifts are still very large. Using new HST data that is being taken now as part of the Frontier Field Initiative, we will be able to make significant progress in the near future. All the information on the above plot and how it is derived can be found in Oesch et al. 2013b and Oesch et al. 2014a. 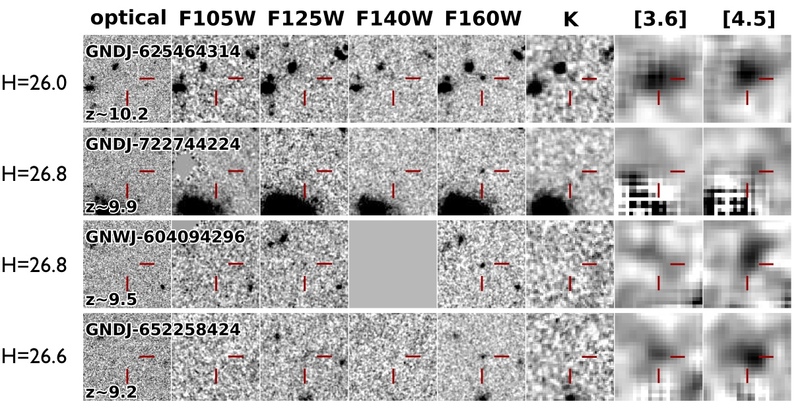 Images in different filters of four bright galaxy candidates at z~9-10 that we recently identified in the WFC3/IR data of the CANDELS survey. At these early times, the neutral hydrogen in the inter-galactic medium absorbs all the light at wavelengths shorter than ~1.3 microns. Therefore, we can only significantly see these galaxies in HST's reddest band (F160W). Amazingly, however, these galaxies are also detected in extremely deep Spitzer/IRAC imaging. This is the first ever robust individual detection of rest-frame optical light at ~500 Myr from the Big Bang, allowing us to constrain the stellar masses of these galaxies. The high luminosity of these sources is somewhat surprising. These galaxies are about an order of magnitude brighter than previous z~10 galaxy candidates, and no other field revealed such bright sources. These galaxies therefore indicate that star-formation in the very early universe was likely highly stochastic, resulting in large field-to-field variations. The individual detections of these galaxies with IRAC motivated our approved Exploration Science program to push to even deeper limits with Spitzer/IRAC over the GOODS fields in order to individually detect a large fraction of known galaxy candidates in the reionization epoch in order to study the stellar mass build-up at early times. © P. Oesch. All rights reserved.